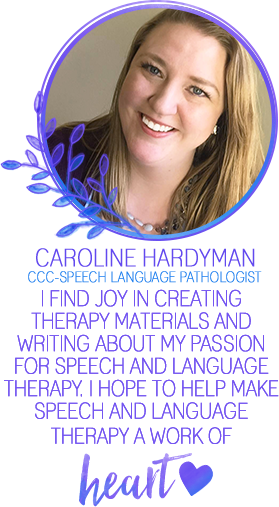 This week, I'm celebrating being SLP Materials Club's featured seller. Stop on by their facebook page throughout the week for exclusive freebies and giveaways. I thought I would kick things off with a post about one of my favorite topics and with a great giveaway! Narrative language is my favorite. Really, I love narrative language. Growing up, I read stories all the time. I wouldn't even waste time putting the books on my night stand before falling asleep; they would simply sleep in the bed with me and fall off during the night, startling my parents or the cat. Sometimes I would write stories. Most of them were short and silly, but when I was in high school, I was convinced I would be the next hit author. I wrote alot and drew maps... but that's not what I'm here to write about. 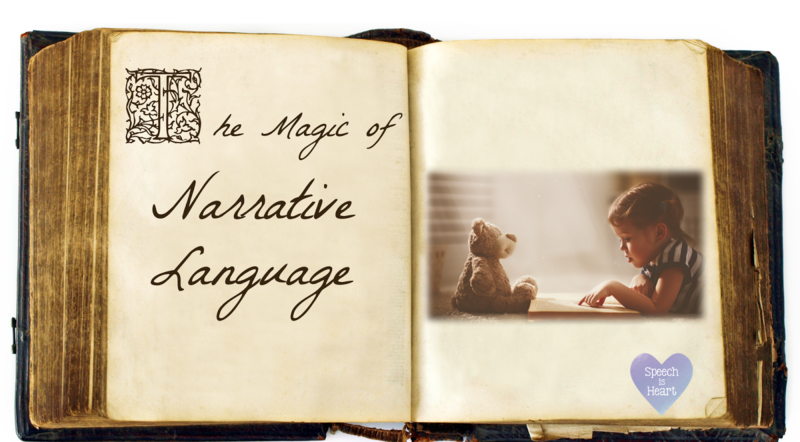 Simply put, narrative language is story telling. Sounds easy right? Most 5 year olds can tell you a complete, perhaps silly, story in a way you can understand. Now compare those stories to those of children with language impairments, and you will understand a whole new level of complexity. "Mr goody glasses, he went off to forest. Found map. Map lead to place where someone live. He be going and going. Pattern on map and pen feather. Wrote message then there's message on back. Beware don't go each way. Then he go to house. Then he found ...go up on tree. Then he swung up. then he found branch. Then he found lava. Throwing party. I sometimes I get parties. My parties and I really don't know." As you can imagine, this was incredibly hard to follow. I think I sat their for a good minute after he was done at a loss of how to respond. Needless to say, he qualified for a language disorder and is now receiving services. One of his IEP goals targets narrative language. When most people think of parts of a story, they think of the characters, setting, problem, solution, etc. When a speech language pathologist thinks of story telling, we consider the vocabulary along with syntax, morphological structure, sequencing, cause and effect, and so much more. The complexity of a narrative will depend on the complexity of a child's language ability. Narrative language is essential for academic success. Think about kindergarten. Children listen to stories every day in the classroom. Students learn to socialize by telling stories about what happens at home. Teachers ask questions about things that happen and students must first understand what happened in order to answer those questions. When learning to read, what do students read? Stories. Narrative language. A student's success within our school system will have a direct link to their ability to retell and generate stories. Everyone is tired of hearing this, but children need to be read to starting very young. My facebook feed is constantly full of "new" studies that confirm over and over again that exposing children to stories at a young age is beneficial. You know what I haven't seen? Any studies saying it's bad. This resource was created by Sandra Gilliam. You may know her name form the Test of Narrative Language (TNL) or from ASHA's 2016 board of directors. I had the opportunity my first year in the schools to go to a seminar she led. She is an AMAZING speaker. If you get the chance, go to one of her presentations. What I love about this resource is that there are lesson plans and it's scripted. I can grab it off my shelf and continue from where I left off with my students. There are visuals ready to go, I suggest laminating them. 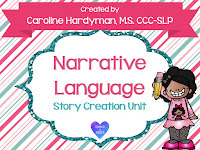 I don't currently have this resource, but I know many SLPs who love to use it. It's a multisensory tool that helps students tie in different elements of stories with a visual and tactile piece. I've hear many good things. Maureen at The Speech Bubble has a neat blog post about it here. Not ready to "bite the bullet" on one of these awesome resources? 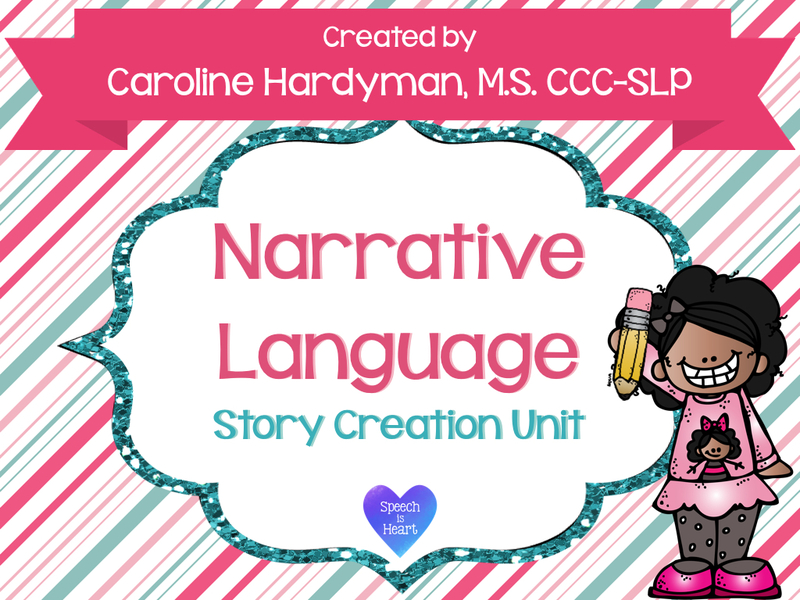 Check out my Narrative Language Story Creation Unit on TPT. This mini-unit is by far my favorite thing that I have created since I started on TPT. I designed it to be easily paired with the iPad app Toontastic. This week, it will be 50% off in my TPT store. 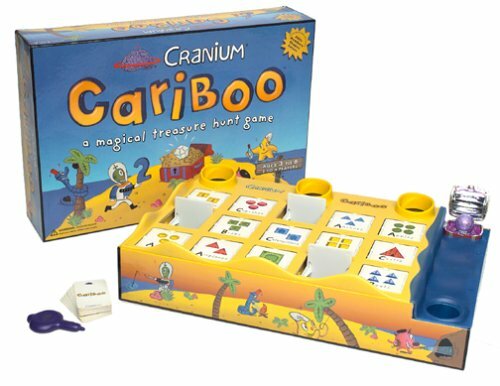 Enter below - one lucky winner will win a hard to find complete Cariboo board game. Don't forget to stop by the SLP Materials Club Facebook page for more giveaways and freebies this week.